Thando Hopa becomes the first woman with albinism to cover Vogue. Thando Hopa, a South African model, lawyer and activist, is on the April cover of "Vogue Portugal" for their "Africa Motherland" edition. The magazine stated that the issue is an ode "to origins" and to "Africa, as the birthplace of mankind". Vogue magazine has started a new campaign to launch more diverse black women into the limelight. The 2019 April issue is a historical one as it features South African model Thando Hopa, the first albino model to grace the cover of this international fashion magazine. The April edition is meant to be a celebration of the full range of African skin and beauty. "This edition celebrates the boundless creative resources of Africans and Afro-descendants through fashion, beauty, art, lifestyle, entertainment and culture," said the features editor at Vogue Portugal, Patricia Domingues. Thando Hopa was named one of the BBC's top 100 most influential women across the world in 2018 for her activism on the discrimination people with albinism suffer for a condition that is hereditary. In an interview with Top Women she said she uses her modelling career to show the beauty of her skin. "There is a contradictory belief that people with albinism bring either good or bad luck. People hug and hold me for good luck, or conversely spit into the necklines of their tops to ward off bad luck, or they make a big show of not wanting to touch me for fear of becoming like me or having children who are like me. I felt like a walking commodity, struggling to find the words to explain how ordinary I am." Relating her experience of landing the Vogue cover to Sowetan Live news website, Hopa said, "I was in total disbelief when I was first contacted to do the cover. My mother thought I was going to be trafficked by a bunch of strangers! The shock was probably because we've never come across a woman with albinism on a Vogue cover. I felt a bit overwhelmed, thinking about the many barriers the very existence of this representation could break." 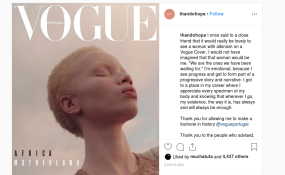 She went on to speak about what the cover means to her on Instagram: "I once said to a close friend that it would really be lovely to see a woman with albinism on a Vogue cover. I would not have imagined that that woman would be me. "We are the ones we have been waiting for." I'm emotional, because I see progress and get to form part of a progressive story and narrative. I got to a place in my career where I appreciate every specimen of my body and knowing that wherever I go, my existence, the way it is, has always and will always be enough." "Thank you for allowing me to make a footnote in history @vogueportugal." An alternate cover of the Vogue Portugal April edition will feature the celebrated model Alek Wek. This will be the second Vogue cover for the British-Sudanese beauty.